Napoléon François Joseph Charles Bonaparte, Duke of Reichstadt (March 20, 1811 – July 22, 1832) was the only son of Napoleon Bonaparte and his second wife, Marie Louise of Austria, daughter of Francis I, emperor of Austria. Known from birth as the King of Rome, he was styled as His Majesty the King of Rome, which Napoleon I declared was the courtesy title of the heir-apparent. 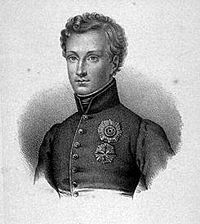 He was first named second Emperor of the French when Napoleon abdicated on April 6, 1813. This was not recognized, however. During his exile on Elba, Napoleon retained the title "Emperor" even though the French Chamber of Deputies had appointed Louis XVIII of France as a constitutional monarch. The Treaty of Fontainebleau (1814) (April 11th, 1814) prohibited any child of Napoleon I from ruling France but ceded the Duchies of Parma, Placentia and Guastalla to Empress Marie-Louise, who was also allowed to retain her imperial title. Her son would become hereditary Prince of Parma. Reclaiming his empire on March 1, 1815, Napoleon ruled for 100 days until his defeat at the Battle of Waterloo. After this, he again named his infant son as Emperor. The Empress was confirmed as ruler of Parma but the victors stipulated that Napoleon II would never govern or succeed her. After the Treaty of Paris of 1817 ratified this, Napoleon II's maternal grandfather compensated him with the nominal "Dukedom of Reichstadt" accompanied by a pension but no power. The victors, fearing that Napoleon II had inherited his father's military ambitions, were determined to prevent another Bonaparte imperial project. Napoleon II's reign as Emperor is dated from June 22 until July 7, 1815. Already more or less a hostage at the Austrian court, where his mother had taken him in 1814, he became a diplomatic tool in the hands of the Chancellor, Prince Metternich. When Napoleon I's nephew became Emperor in 1852, his adoption of the title Napoleon III confirmed the legitimacy, for Bonaparte sympathizers at least, of Napoleon II's reign. On the one hand, it can be argued that Napoleon II was not a significant actor and can be dismissed as of little importance. On the other hand, as long as he lived, he possessed what some saw as legitimate claims to sovereignty over various territories, so much so that both his name and his claims were never far from the minds of European leaders as they vied to promote their own interests over and against others'. As long as he lived, his claims could not be ignored. Three years after Napoleon François birth in Paris, the First French Empire— to which he was heir—collapsed, and Napoleon abdicated for the first time in favor of his infant son, whom the empress took to Château de Blois in April 1814. The Treat of Fontainebleau allowed Napoleon, who was to go into exile on Elba, to retain his imperial title but demanded that he relinquish power. The French then appointed Louis XVIII as a constitutional monarch. In February 1815, Napoleon embarked on his final bid to regain power. Reclaiming his right to rule, he launched what history describes as his final 100 days on March I, 1815. Louis XVIII fled from Paris. Now estranged from her husband, Empress Marie-Louise (whose right to retain the title "Empress" had also been granted at Fontainebleau), refused to join him in Paris or to allow her son to do so. In 1815, after his defeat at Waterloo, Napoleon again abdicated in favor of his son, whom he had not seen since his exile to Elba. It was only in the confusion that followed the definitive end of the Napoleonic era as Europe's borders were reshaped and new governments installed in some states that Napoleon II enjoyed limited recognition as Emperor of the French. In reality, he was only ever a pretender. The Chamber of Representatives and Chamber of Peers did recognize him as Emperor from the moment of his father's abdication (June 22, 1815) but when the Allies entered into Paris on July 7, even the fiction that Napoleon II was Emperor of the French ended. Napoleon II, or Franz, as the Duke of Reichstadt. 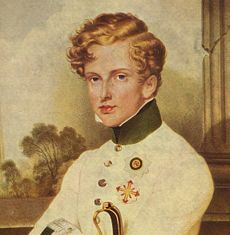 After 1815, the young prince, now known as "Franz," after his maternal grandfather, rather than as "Napoleon," was a virtual captive in Austria where his grandfather awarded him the title of Duke of Reichstadt in 1818 after the Treaty of Paris (1817) reversed the earlier decision that he would inherit the Duchy of Parma, and other duchies, from his mother with the hereditary title of "Prince of Parma." Not only was he barred from inheriting but he was also barred from participating in the governance of the Duchy during his mother's lifetime. In Austria, he was kept more or less as a hostage. Partly, his grandfather accepted a moral responsibility to ensure his safety. Partly, Austria's powerful Chancellor was aware that he could be used as a tool to aid and abet his own scheme to maintain stability in Europe. The threat of supporting his claims over those of, for example, the King of France helped to suppress any possibility that France might try to recover territory lost after Napoleon's fall. Franz's mother, who was allowed to take part in the governance of Parma (which was combined with Placentia and Guastalla) for the duration of her own life-time, was absent there most of the time. In fact, she shared rule with her new husband, Count Adam Albert von Neipperg (1775-1829) until his death. She died there in 1847, and reputedly ruled competently with a genuine concern for her subjects. The dukedom then reverted to the Bourbons, who had ruled before the Napoleonic occupation (1796). "Franz" was educated and given military training but the latter may have contributed to the policy of denying him any exercise of power. His tutors reported that his personality had a military, or warlike disposition, which may well have influenced Metternich's decision to block—even if at times he appeared to support—a possible restoration of his rule. We know the movement in Italy is a Bonapartist one. We are resolved to resist it. The Emperor owes so much to his empire, and to all that is yet left standing in Europe. By this determination we at the same time render the most signal service to King Louis Philippe. If, on the simplest showing, there was an incompatibility between his existence and that of a subordinate member of the Bonapartist family on a throne contiguous to weak and feeble France, how much more real does that incompatibility become in view of an Italy placed beneath the scepter of Napoleon II! Yet this is the direct object of the party of anarchy; against which we are still struggling. The branches of the House of Spain and Naples could offer no opposition to the viewers of the French and Austrian Cabinets when thus united; Italy would remain firm in her allegiance; Germany would prove no source of danger; the new King of England would gladly efface, by a recognition of Napoleon II., the shame incurred by the Government of his country through its conduct to the dying Emperor Napoleon; the successor of Alexander cannot be insensible of the regret manifested, towards the end of his life, by that Prince, for having been instrumental to the scheme of recalling the Bourbons into France; Prussia cannot be desirous of a new revolution in France, knowing as she does that she would be the first to feel the effects of it, and the other Powers cannot have forgotten her conduct during the first war of the Revolution. Indeed, "Napoleon II, entering France under the national colors, and guided by a man whose entire love and devotion to his country are well known, is the only person who can hinder the usurpation of the Duke of Orleans, who, having been called to the throne neither by right of succession nor by the distinct and legitimate expression of the national will, can only maintain himself in :power by flattering every party in turn, and yielding to the one that offers him the greatest chance of success, at the cost of whatever means. Napoleon would prevent republican agitations from making head in France, Italy, Spain and Germany. Napoleon, Emperor of the French, would be bound, by ties of gratitude, affection and political interests, to Austria, the only continental state with whom he would stand in a similar connection." While others championed his cause, Napoleon II himself spent much of his time exercising. Reportedly, he over-extended his physical abilities and consequently weakened his chest, which made him prone to tuberculosis. As agitation for his restoration in France, and support for his possible claims in Italy, reached their zenith in the early 1830s, his health was in serious decline. On July 22, 1832, Napoleon II died, presumably from tuberculosis at Schönbrunn Palace in Vienna. 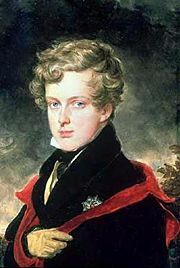 After the death of his stepfather, Neipperg, and the revelation that his mother had borne two illegitimate children to him prior to their marriage, Franz said to his friend, Prokesch von Osten, "If Josephine had been my mother, my father would not have been buried at Saint Helena, and I should not be at Vienna. My mother is kind but weak; she was not the wife my father deserved". Gail S. Altman has suggested that his death was the result of deliberate lead or arsenic poisoning at the hands of agents of Metternich's police state. Napoleon II remains of symbolic significance in the context of the story of the Bonaparte family and their place in European history. As the recognized head of the family, he gave hope to Bonaparte supporters that one day a Bonaparte might rule again. His death without issue meant that leadership of the family devolved to members who were not directly descended from Napoleon I but from his siblings, including the man who eventually became Napoleon III. Napoleon II was very close to Princess Sophie of Bavaria and it has been further suggested that he was the father to her son, the future ill-fated Emperor Maximilian I of Mexico. In 1940, Franz's remains were transferred from Vienna to the dome of Les Invalides in Paris as a gift to France from German dictator Adolf Hitler. The remains of Napoleon I had been moved there in 1840. For some time, the young prince rested beside his father. Later the remains of Napoléon François Joseph Charles Bonaparte were moved to the lower church. While most of his remains were transferred to Paris, his heart and intestines remained in Vienna. They are in Urn 42 in the "Heart Crypt" (Herzgruft) and his viscera are in Urn 76 of the Ducal Crypt. Napoléon François Joseph Charles Bonaparte was also known as "The Eaglet" (L'Aiglon). Edmond Rostand wrote a play, L'Aiglon, about his life. Serbian composer Petar Stojanović composed an operetta "Napoleon II: Herzog von Reichstadt," which premiered in Vienna in the 1920s. Arguably, Napoleon II was only ever recognized as Emperor by Bonaparte sympathizers. To some degree, this can be even be argued with reference to his father, whose claim to imperial rank was, for example, never officially recognized by the British, for whom he was "Napoleon Bonaparte," not the legitimate emperor of anywhere (or of anyone), or "His Imperial" anything! Since "His Imperial Majesty" was a higher style of address than that of the British monarch, who was simply "His" or "Her Majesty" the British were not about to allow someone who was only from the lesser nobility (and from that of Italy) with no royal blood, to use this style of address. Nonetheless, whether his imperial status was legitimate or illegitimate, Napoleon I left no small mark on history. In comparison, his son appears to have been a victim of circumstance rather than a prime actor. On the other hand, his mere existence played some role, or contributed to, movement towards Italian unification, the eventual ascent of a Bonaparte as France's third Emperor, even deliberations at the Congress of Vienna and at other international meetings. Even though his role was passive, he played a part in the unfolding story of how the European space reshaped itself following his father's fall. Napoleon II's own ancestry, on his maternal side, was that of the illustrious Habsburgs, and could hardly be faulted by those who attached significance to a royal lineage. ↑ Napoleon asserted that the heir of the Roman Emperors had been called "King of Rome". ↑ 2.0 2.1 2.2 Klemens von Metternich, "Metternich on Modena, 1831" in Gerald W. Smith (trans.) and M.A. de Klinkowstrom (ed.) Memoirs of Prince Meternich, 1830-1835, Volume V (New York, NY: Howard Fertig, 1970). ↑ Joseph was Napoleon's older brother. He was at various times King of Naples and Sicily, King of Spain and the Indies, then after the Empire's collapse lived for some time in the USA. After Napoleon II's death, some Bonapartists recognized him as the rightful Emperor although he is not referred to as such. ↑ Joseph Napoleon Bonaparte, "Joseph Napoleon Bonaparte to Metternich (letter); Point Breye, October 9, 1830" in Metternich (1970), 109. ↑ Felix Markham, 1975, p. 249. ↑ Jean Smith, Maximilian and Carlota (New York, NY: Morrow, 1973, ISBN 9780688001735). This page was last modified on 27 May 2008, at 18:38.